Despite Georgia's loss, country music star Jason Aldean had a blast at the National Championship game. Check out these pictures of his experience! 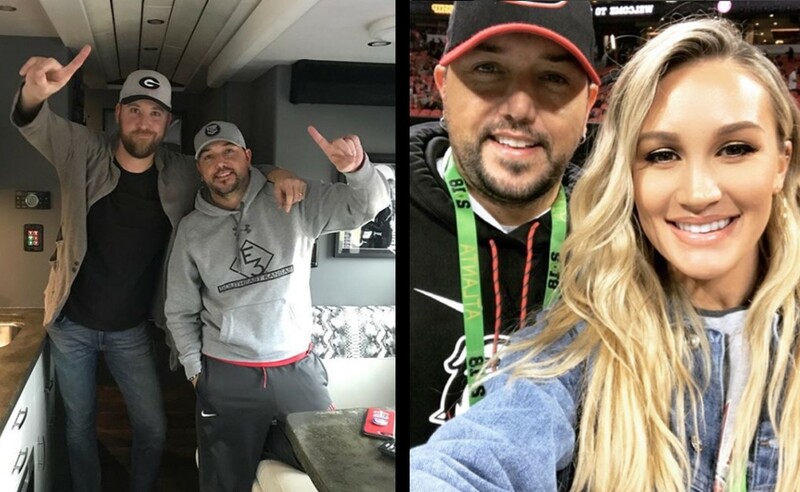 Yesterday, Jason Aldean‘s Georgia Bulldogs faced off against his wife beloved Brittany‘s Alabama Crimson Tide in the College Football Playoff National Championship. The pair attended the epic SEC showdown with friends Charles Kelley of Lady Antebellum and his wife Cassie in tow. Although Brittany was surrounded by rabid Bulldogs fans in Atlanta, that didn’t stop her from representing her favorite team to the max. While Ma and Pa Aldean cheered on their respective teams, baby Memphis was at home in Tennessee with his grandparents. Ultimately, Alabama proved victorious with a final score of 26-23. Though Jason and Brittany love their football, they keep their loyalties in check for the sake of their relationship. Check out these snapshots from this crew’s adventure! Yes, they totally too a tour bus to the game! Go big! Brittany gets resourceful to protect her game day look! Cassie and Charles strike a pose! Soaking in all the football goodness from up close. Share this update with other fans of this couple!